perfect shutters for your home. Stanfield Shutter Company uses only the finest architectural elements in the market today coupled with the finest craftsmanship in our field. For these reasons we guarantee our products against any defect in our material or workmanship, to the original owner, for as long as you own your home. Should any such defect occur we will repair the necessary components free of charge. Service charges may apply. Wood and Composite materials have natural variations in color and pattern that enhance the uniqueness of the design and are not to be mistaken for defects. Stanfield Shutter Company is not liable for the natural durability of a particular medium; nor any indirect or consequential damages arising out of improper usage; neither are we responsible for any damages caused by or attributed to Acts of God, fire or water. Stanfield Shutter Company considers each shutter we create to be an enhancement for each window we cover, often your finest custom product for each window, and we hope you enjoy them as such for many years to come. Thank you for your patronage. Why should I choose Stanfield Shutter over another manufacturer? Is there really an advantage to buying shutters from a local company instead of a cheaper national manufacturer? Yes. Not only will the shutters ordered from Stanfield look and fit better, but you won’t have to worry about a single thing. National manufacturers will ship the shutters to you and then either tack on a surcharge to install them or leave that task to you which can be quite daunting. Typically we have found that you will spend more money and have more headaches with national manufacturers then dealing with a locally owned and operated company like Stanfield Shutter. What materials does Stanfield Shutter use in their shutters? There are three basic categories for shutter materials: natural hardwood, engineered hardwood, and synthetics. Natural hardwoods are woods that have been grown from the ground cut down and sent on their way. Most people are familiar with Cherry, Oak, Basswood, and Knotty Alder. Engineered hardwood is a broad term that covers any wood product that has gone through additional refining processes. We use premium High Density Fiberboard (HDF) in our painted shutters because they don’t warp. Finally the synthetics or vinyl type products are nice in watered areas, but be sure not to purchase a hollow or wood wrapped vinyl since the quality is not very high. For a more detailed explanation of these products please see our pages on HDF, Basswood, Knotty Alder, and Vinyl Synthetic shutters. What type of finish does Stanfield Shutter use on their shutters? Stanfield Shutter is currently the only shutter company in Utah to use water based paint on their shutters. This type of paint is more resistant to UV damage then any other finish utilized in the industry. It will not yellow unlike the Conversion Varnish or Lacquer based paints used by our competitors. We use CAB Acrylic stains and sealers on our stain grade shutters which again, will not yellow like our competitor’s finishes and is very resistant to UV damage. Why does Stanfield Shutter favor HDF for paint grade shutters over natural hardwoods like Basswood? Stanfield Shutter does not favor one product over another because we can build shutters out of anything. With that said there are certain characteristics that most of our customers are looking for which leads most of them to choose HDF. HDF or High Density Fiberboard is a technologically refined and advanced wood product that is warp-free. It also has a smoother surface which helps the finish look nicer. There are also less unknowns and uncertainties with HDF. While natural hardwoods are very nice, but they can warp over time. Generally speaking natural hardwoods perform very well, but most of our customers prefer a product that won’t warp. In addition, if the shutters are not stained, it makes sense to use the product that will last the longer and be more durable. The final, and perhaps most important reason our customers prefer HDF is it is less expensive. What is the maximum panel width I can order? Wide panels pose more problems for shutter manufacturers and future service and durability issues. If a panel is too wide the blades might deflect or sag in the center. In addition, natural hardwood panels that are excessively large are more likely to warp. Stanfield Shutter suggests that any window larger then 30” be broken up into 2 panels, windows under 30” can be broken up according to the customer’s preferences. We will, however, make panels as wide as 36” upon customer request, but those panels will be covered under a more limited warranty. Once I order my shutters, how long will it take to produce them? Production time varies throughout the year and typically ranges from 4 to 8 weeks depending on the number of orders we have in. Production time begins once we have final measurements, paint or stain color selection, and a deposit. For current production time please contact a Stanfield Shutter representative. What is the difference between wood, engineered hardwood, composite, and vinyl? The answer can vary quite a bit depending on the company with whom you speak. Natural hardwood is wood that has been grown from the earth, cut down, possibly dried in a kiln, and sent on its way. Engineered hardwood is natural hardwood that has been technologically refined to perform better then natural hardwood. Composite materials are a combination of two or more products. This could be wood and vinyl, two types of wood, two types of vinyl, etc. The HDF used by Stanfield Shutter is an engineered hardwood product but it is not a composite since the HDF we purchase is only made with one species of natural hardwood. The engineered hardwood used by our competitors may be composites since they do not have access to the same lumber mills we do. Vinyl is all vinyl without any other material added in. How does Stanfield Shutter compare in cost to other shutter companies? When comparing apples to apples Stanfield Shutter typically has the lowest cost around. However, every once-in-a-while one of our competitors has an unexpected sale or promotion. Because of this Stanfield Shutter will beat any competitor’s bid with similar types of shutters (materials, finishes, etc) and warranties. What type of warranty does Stanfield Shutter offer? Stanfield Shutter offers a limited lifetime manufacturer’s warranty on all of the shutters we produce. In a nutshell we cover anything that should not occur to the shutter under normal conditions. Defects that occur due to nature, unpredictable circumstances, or “acts of God” (events that occur randomly over which we have no control) are not covered under the warranty. To clarify, the screws are guaranteed not to strip out for the life of the shutter, however, if a child has been swinging on the shutter and causes the screws to strip out the resulting damage is not covered. The paint is also guaranteed against bubbling, however, the damage caused by spilling hot oil or excessive amounts of water on the wood shutters causing the paint to bubble would not be covered. Generally speaking, if you are taking proper care of your shutters most things are covered. Please see the warranty for more specific information. I have weird shaped windows, can Stanfield Shutter make shutters for my windows? Yes. Stanfield Shutter custom engineers and builds all our shutters to fit each window. We can do circles, ½ rounds or circles, ¼ rounds or circles, ovals, octagons, angles, arches, triangles, hexagons, squashed arches, eyebrows, sliding glass doors, and of course square and rectangular windows. If you would like to see some pictures of our shutters feel free to visit our photo gallery. What louver blade sizes does Stanfield Shutter offer? We offer the largest selection of louver sizes available in Utah. Our louvers vary in size from 1 ¼ inches to 5 ½ inches and anywhere in between. The most popular blade is the 4 ½ inches with 3 ½ inches being a close second. We leave the choice up to the customer since each person has individual tastes and decorating styles. Once we have met with you and have had the opportunity to get a feel for your preferences we may suggest certain sizes over others, but you should always feel free to select any size you like. Other shutter companies use oval louvers, why does Stanfield Shutter use flat louvers? There are several reasons for this difference. The first is that Stanfield Shutter is one of the few companies that actually manufacturers its shutter parts from scratch. Most of our competitors order from national part manufacturers and then cut and assemble the parts here. Because of this our competitors do not have the ability to adapt their production process and shutter design. Stanfield Shutter changed the louver design 15 to 20 years ago due, in large part, at the request of the best interior designers and decorators. Interior designers had been getting a lot of complaints from their customers that people did not recognize their “shutters” as “shutters” and kept on complimenting them on their “blinds.” They brought this concern to Grant Petersen and Gary Stillman (who are still working at Stanfield incidentally). After a great deal of research it was determined that because the trailing edge of the oval louvers was so small it made the shutters look like they were blinds. So, Grant and Gary developed the flat louver to resolve the problem. Interestingly enough, the flat blade is thinner in the center then the oval louver which gives customers a better view. Once the flat blade was implemented it was also discovered that the staples held better and the blades were more durable and resistant. So all in all Stanfield Shutter recommends the flat blade because it has a better design, it lasts longer, and it provides a better view. If you prefer, however, we can build your shutters with the oval louver. What are the parts of the shutter called? A) Shutter-the shutter is the entire window covering entity installed into the opening. It consists of all the parts, panels, and frame and can be quite large. Our example picture is only one shutter and two panels. B) Panel-the panel consists of one set of stiles, rails, and a section of louvers. Our example picture consists of two panels and only one shutter. The panels swing open on hinges much like your doors. C) Rail-the pieces at the top and bottom of the panel that provide structure to the shutter. A divider rail can also be places in the panel to separate the top and the bottom louvers. Every shutter panel has at least a top and bottom rail. D) Louvers-the louvers are the blades that rotate open and closed. They vary in size from 1.25" to 5.5" and are all operated uniformly by the tilt rod. E)Tilt Rod-the tilt rod is the bar in the center of the panel that operates and rotates all the louver blades at once. F) Stiles-the stiles are the vertical supports that the louver blades connect into. The top and bottom rails also join with the stiles to form the structural support for the louvers. All shutters have stiles. G) Frame or Mount-the frame surrounds all the panels in a particular panel set. The frame is usually attached to the inside of the window jamb, the wall, or a door. There are numerous frames and different applications require different frame mounts, but most shutters have some sort of frame. Shutters are more architectural in look and design. They do not have any strings and the louver blades cannot be pulled up to the top instead the louvers rotate open and closed and the panels swing open on hinges much like a door. The louver blades are typically wider then the standard blind as well providing a better view. Shutters can also last a lifetime. Blinds, on the other hand, have strings that are used to rotate the blades and pull them up to the top of the window. The louver blades are smaller, typically around 2 inches and the architecture of a blind is much more simple then that of a shutter. Blinds, by their nature, will not last as long as shutters, in fact industry standard for the life of a blind is 3 to 5 years. What is the difference between painted and stained shutters? Painted shutters are one, solid, uniform color. Most whites, off-whites, creams, darker earth tones, etc are paints. If you cannot see the material under the finish it is more then likely a painted finish. Stained shutters allow the natural grain to show through the finish. The stain itself can be tinted to a number of different colors, but the defining feature for a stain is the ability to see the natural wood grain through the finish. Stains can also vary depending on the species of natural hardwood that is used since each species has its own unique characteristics. 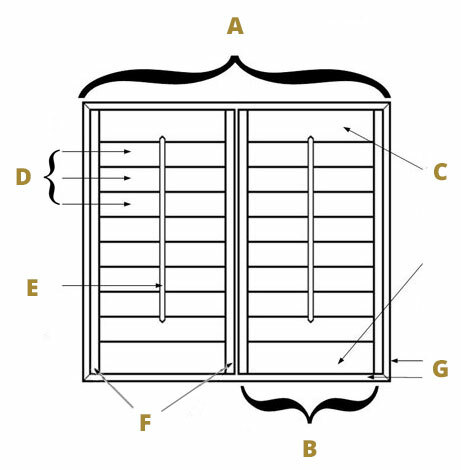 What is the difference between a Plantation Shutter and a Traditional Shutter? The architecture is the most noticeable difference between the two types of shutters. The architecture in Plantation Shutters is usually more pronounced and robust. Plantation louver sizes are also larger typically ranging from 2 ½ inches to 5 ½ inches and the panels are wider averaging between 18 to 30 inches. The architecture in Traditional Shutters is not as pronounced as the Plantation Shutters. Traditional louver sizes usually range from 1 ¼ inches to 1 ⅞ inches and the panel width usually ranges from 8 to 12 inches. Yes and No. Any type of wood shutter is not waterproof no matter what type of finish is applied or how well it is sealed. That’s why exterior decks have to be refinished every few years. There is an alternative in watered areas, however. All vinyl shutters are waterproof. While they are more expensive then the more common wood shutters they will save you repair costs resulting from water damage over time. How do I get prices for shutters? The free-in-home quote is the most popular way of obtaining shutter prices. While measuring your windows our representative can look at your window jamb, molding, locking mechanisms, décor, etc and then recommend the best shutter for your home. We can give you an estimate over the phone or via e-mail if you provide us with the window dimensions and shape, your name, the city in which the shutters will be installed, and the type of shutters you would like (painted v. stained, wood, vinyl, louver size, etc), but if your measurements are off or you require a difficult mount the estimate could change. Click here to contact us if you would like an estimate. Do you have to put a tilt rod down the center of my shutter panels? No we do not, however it is recommended that you do. When shutters do not have a rod in the center of the panel it is placed on the back side of the panel. This is called the rodless or sometimes the clear view design. The rod is then connected to the tilt rod with a nail. This design has several disadvantages. First, the area of the louver where the nail is shot into is a weak point and often results in the nail splitting out and breaking the louver. Second, if the nail works its way out and you rotate the blades the nail will damage the stile and could possible break the louver. Third, people get used to grabbing one louver and using that to open and close the shutter which puts undue stress on that louver which could break over time. Finally, customers purchase shutters for their architecture and design, without a tilt rod in the center the shutters look more like a blind then a shutter which defeats the purpose of investing in shutters. How do I choose my paint or stain colors? Most interior designers suggest that you match your trim. If you don’t have any trim or don’t want to match it then white is the best way to go. Stanfield Shutter has several standard paint and stain colors from which you can choose. Our representatives can show those to you when they measure for shutters. If one of our standard paints or stains does not meet your approval we can do a custom match for you for a nominal fee. If you have us do a custom match you are required to provide us with a physical sample with the paint or stain on it.